Thank you for another amazing year of Cub Scouts! 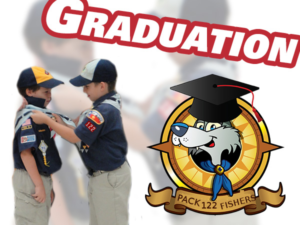 In celebration of your son’s year of scouting, we are holding our Pack Graduation at 6:00 PM on Saturday, May 19, 2018 at Camp Belzer, 6102 Boy Scout Rd. Indianapolis, IN 46226. The pack is providing drinks (water and lemonade), burgers, hot dogs and cake for dinner from 6:00 – 7:00 PM in the Gyro Club Dining Room. It is our understanding that Camp Belzer is on well water so we are suggesting families bring their own drinks if they don’t want to drink the provided water and lemonade. Please bring whatever side dishes your family would like with dinner. Graduation will take place outdoors at the Kiwanis Shelter weather permitting (graduation will be in the One America Room if the weather doesn’t cooperate). After graduation, the pack leadership is holding a planning and budget meeting while the boys participate in outdoor activities. All interested den leaders and parents are welcome to attend. We need several volunteers to help with transitioning leaders exiting the pack – please let me know if you are interested in volunteering. Thank you for another amazing year of Cub Scouting and please keep an eye out for announcements about optional summer activities. Pack 122 is the oldest Cub Scout Pack in Fishers, Indiana, founded in 1963. We are in the Del-Mi District of the Crossroads of America Council of the Boy Scouts of America. We are chartered by The PROMiSE Church. Although we hold our meetings and events at our chartered organization, you do not have to attend or be a member of The PROMiSE Church to participate in Pack 122. Our pack serves Kindergarten through Fifth Grade and our scouts primarily attend Fall Creek Elementary School in Fishers, but all interested boys are welcome to join Pack 122. Our pack committee consists of many trained volunteers that assist your son on his journey through Cub Scouting. We meet monthly as an entire pack and your son's cub scout den (6-12 boys in the same grade) meets 1-2 times per month.